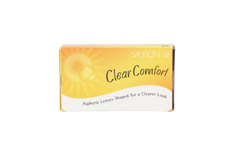 Clear contact lenses from Clearlab are leading the way in the field of tolerability. They are biocompatible and thus friendlier to the eye than conventional contact lenses. Biocompatible contact lenses contain natural materials, resulting in a verifiable improvement in the retention of moisture. For this reason Clear contact lenses are ideal for people who suffer from dry eyes. Another great benefit with biocompatible lenses is that the possibility of an immune response from the eye is reduced to a minimum. Clearlab and Clear contact lenses are also creating waves in other aspects of lens design. Clear55A contact lenses produce an outstanding quality of image thanks to their sophisticated aspheric lens design. 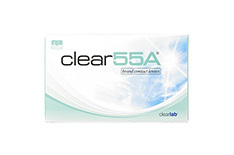 In addition, Truform - the new ultra slim edge design for Clearlab Clear55A contact lenses - ensures ideal positioning of the lens on the eye and enables the wearer to enjoy exceptional vision in all situations. 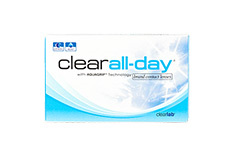 The ClearAll-day series, which comprises ClearAll-day and ClearAll-day T toric contact lenses, offers an even higher level of long-term comfort for the wearer. Wearers of one-day lenses can also benefit from the trend-setting technology offered by Clearlab. 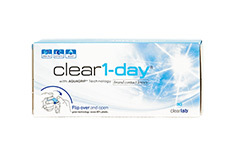 Clear1-day contact lenses feature mucin, the biocompatible active agent that binds moisture in the lens. Daily lenses from Clearlab also come with the patented Truform edge design. All Clear daily and monthly lenses supply the eye with the oxygen needed for impeccable comfort that lasts the whole day. They are produced to an outstanding quality and are subject to the strictest of quality controls. Order Clear contact lenses from the Mister Spex online store and you can enjoy the benefits of our fantastic service. Be sure to take a look at our unbeatable offers on multiple packets and corresponding care solutions - see how much you can save in the Mister Spex online store.